The harmonized sales tax is going up on P.E.I., to 15 per cent in October. The increase was announced in the annual budget speech in the legislature Tuesday, presented by Finance Minister Allen Roach. 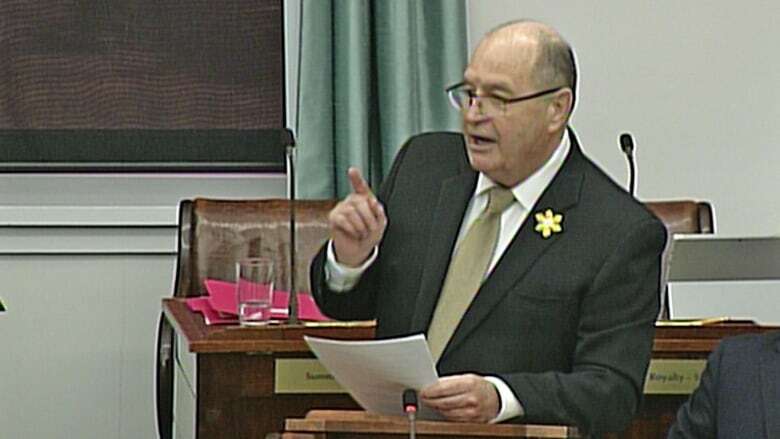 In his budget speech, Roach said an increase in revenue was necessary to maintain core services in the province, and an increase in the HST was the best option. "Experts agree that increasing consumption taxes like the HST are less harmful to economic growth than increasing income taxes for individuals," said Roach. The tax, currently 14 per cent, will go up effective Oct. 1. The province estimates the increase will provide a further $11 million in revenue over the half year it is in effect in 2016-17, and an extra $22 million in future years. Roach told the media in the budget lockup that the province was not influenced in its HST decision by increases in the tax in Nova Scotia and New Brunswick. "Not at all," said Roach. "We have our own budget process on Prince Edward Island." During that budget process, said Roach, government officials heard Islanders were concerned about cuts to services, and decided to move to increase revenues rather than reduce expenditures. P.E.I. budget 2016-17: should the government try to balance it?